Takeji Asano was born in Kyoto in 1900 and underwent a long and intensive art training - first at the Kyoto City School of Fine Arts, from which he graduated in 1919, and later at the Kyoto City specialist School of Painting, with graduation in 1923. One of his teachers was Tsuchida Bakusen. 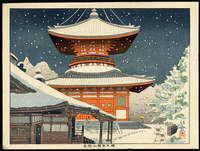 In 1930 Asano participated in the series "Sosaku Hanga Shin Kyoto Junikagetsu" (Creative Prints of Twelve Months in New Kyoto). Other contributing artists were Tokuriki Tomikichiro and Asada Benji. 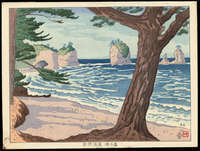 Further landscape prints followed in the 1930s. 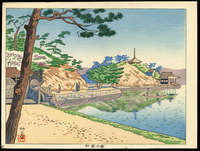 After the war in 1947, Asano created the series "Kinki Meisho Fukei" ("Famous Places in Kinki" - the Kyoto-Osaka area). This series was self-carved and self-printed by the artist with a high technical level. In the 1950s Asano created many works that were published by Unsodo. In 1954, he produced the series "Kinki Hakkei" (Eight Views of Kinki), and in 1956 he produced the series "Tokyo Meisho" (Famous Places in Tokyo). All prints were self-carved and self-printed (see both series below). Asano died at the age of 99 in 1999. I have several prints by Takeji Asano available here.
? 1960 5 scenes confirmed Prints have slim silvered margins and are mounted on a decorative cardboard. 京洛名所続編 1957-58 ? Shikishi (square) format. See my JAODB research database for some scenes from this series. 東京名所 1956 10 scenes See this series below. 京洛名所 1955-58 12 scenes Shikishi (square) format. See my JAODB research database for the full series. 近畿名勝¹ 1954 8 scenes See this series below. Title has not been confirmed. 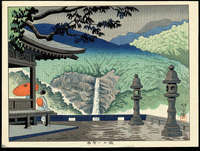 Eight Views of Nara ¹ 1948 8 scenes?? Title has not been confirmed. I suspect that this is the same series as "Famous Places in Nara" below. 奈良名勝 1947-1948 8 scenes 1947/04 "Nanen-Do Temple in the Rain"
1947/11 "Yakushi-Ji Temple in Autumn"
1948/01 "Snow at Sarusawa Pond"
Famous Places in Kinki ¹ 1947 ² ? Title and date have not been confirmed. May be the same series as "Views of Kinki" below. Views of Kinki ? ? One scene of lighthouse confirmed. 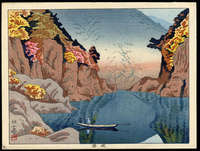 1940/10 "Obakusan in Early Autumn"
1934/07 "Night Moon at ?? 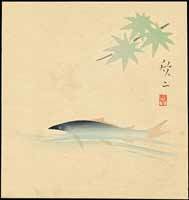 River"
(新京都風景) 1930 12 scene, unconfirmed In collaboration with Tokuriki Tomikichiro and Asada Benji. New Kyoto Views ? 2 scenes confirmed Limited edition of 100 sets. 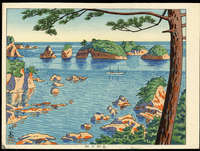 Views of Wakayama ¹ ? ? (at least 7 scenes) See this series below. Title and date have not been confirmed. Mt Fuji 1940s? 4 scenes Postcard-sized prints. See this series below. Noted Places of Nara 1950s? 4 scenes Postcard-sized prints. See this series below. 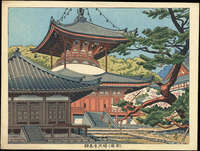 Eight Views of Noted Places of Kyoto Post-war 8 scenes Koban-sized prints, with album. Four of these scenes were also used in the series "Noted Places of Kyoto" below. Noted Places of Kyoto Post-war 4 scenes. Koban-sized prints, with album. Takes 4 of the same scenes from the above series "Eight Views of Kyoto"
¹ Title has not been confirmed. ² Date has not been confirmed. If you have information regarding prints not listed above, please email me scans of the prints and any titled folder covers. This is a rare series of 10 landscape prints by Takeji Asano (self printed and possibly self-carved). The series came with all 10 prints held in a large canvas 'tatou' folder that is held closed by two ivory pins. Each print is held in its own separate paper folder with cutout window. On the verso of each folder is an explanation of each scene written in Japanese. Another beautiful landscape series by Asano!